Wherever illegal money exists, there is a need to “launder” that money so that it can be used in the legitimate economy. In the earlier part of the 20th century, most “money laundering” schemes came from criminal activities. American and foreign Mobs flourished in the first half of the 20th century, initially as relatively unorganized groups that profited from extortion, robbery, gambling and other illegal activities. Individual criminals, or even a small gang, could live a comfortable life outside of the legitimate economy. That life would need to be conducted entirely in cash, but that wasn’t a problem when cash was the predominant economic medium. Just as corporations grew in size, criminal organizations also merged and grew, and began to generate much more money than in the past. At the same time the economy moved to credit, credit cards and banking institutions. The new crime mobs had far more money than ever before, but had fewer ways to move that money back into the legitimate economy to buy a car, house or a business. The Mob was “stuck” with massive amounts of cash, and few ways of using that cash without exposing themselves to criminal prosecution. 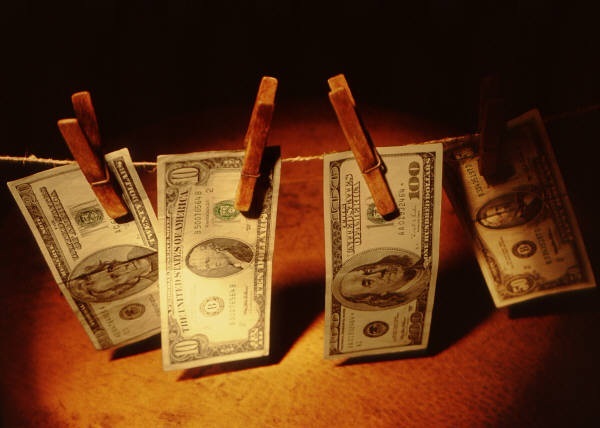 Today, we’re going to look at the origins of money laundering, how the process works and then we’re going to identify future money laundering threats. The interest in large scale money laundering probably begins with the infamous Chicago Crime boss, Al Capone. Capone had worked his way up the mob ranks and had big plans for the Chicago mob. As Capone began his reign over Chicago, the federal government passed the Volstead Act, making the sale of alcohol illegal. This provided Capone’s organization with a huge market for illicit alcohol, and the ability to charge virtually any price for an already highly profitable commodity. In today’s money, Capone made billions of dollars annually. As revenues and violence escalated, many legal organizations tried to stop Capone and failed. Capone was a clever opponent with vast resources, who had managed to corrupt local police, politicians, judges, newspapers, and entire communities. Even the fledgling FBI failed to stop Capone without much success. Then, an FBI agent named Elliot Ness began investigating revenues from Capone owned businesses. This worked was then refined by Frank Wilson, who matched revenues to Capone’s income taxes, and eventually won a conviction for the notorious gangster. This experience taught the government that It’s easier for criminals to cover up a crime than to cover up the income from crimes, especially in large criminal organizations. They also learned that by effectively limiting the movement of illegal profits into the legitimate economy, you can limit the size and power of crime families. However, criminals also learned from the Capone conviction. They learned that big piles of money can be a double-edged sword. If you spend a lot of money, you need to explain where it came from. Even if the government can’t prove it came from a criminal activity, you still need to prove it came from… somewhere! If you can’t, you will leave a trail on your tax forms that will eventually end in a jail sentence. Alternatively, you can just sit on your pile of cash, but if you can’t spend the money why bother to even break the law to make the money? Of course, if you had a magic machine that could cleanse money of illegal activities, getting the money into the economy would be a cinch. Criminals have been looking for that magic machine for decades. The best example in the 20th Century was the cigarette vending machine. You could find one in any bar, club or dinner, anywhere in America. It starts with PLACEMENT, when the Mob creates a company to install the machines and will mark up the sales on each machine to show revenue. The revenue claimed through thousands of individual cigarette machines becomes very difficult for the police or the IRS to trace. Blending legal with illegal money on each cigarette machine creates enough confusion to hide illegal money. This LAYERING of money can be further complicated by introducing illicit cigarettes (stolen or with forged tax stamps), altering purchase records to make sales appear higher, and movement of money though other fake corporations. Once the money has been passed through a bank, perhaps changing hands and names in the process, it comes out the other end of the banking system (INTEGRATION) as clean, legitimate money. In a simpler time, this process work very well. But times changed. Cigarettes were slowly banned from most public meeting places, but new scams replaced the old. The rise of credit cards, and then on-line business and the connected global economy, created new opportunities to create illicit profits and to launder the money. Electronic transfer increased the speed and size of money laundering schemes. Today’s globally connected world means that money laundering can begin or end anywhere in the world, as funds move across borders. The high speed processing of computers makes it possible to slice money into smaller increments and spread them across a much larger number of accounts than would be possible working manually. Banks and financial institutions have countered with tighter controls and computer based monitoring. Modern money laundering looks less like a recognizable series of transactions than a cloud of data patterns pulsing across the globe. The basics of money laundering hasn’t really changed. It starts with placement of funds, followed by layering of deals and accounts to hide transactions, and ends when the “clean” money is integrated into a well laundered account in the legitimate economy. Computers make the process faster and global market makes it harder to find, but this game of cat and mouse has remained the same for decades. But it’s about to change. E-commerce has added some interesting twists to money laundering, and a big player in e-commerce may be about to start the next big thing in money laundering. And that’s where we will pick up part 2 of this blog, but for now… that’s my Niccolls worth! This entry was posted in Best Practices, Decision Making, Unique Ideas and tagged AML, Measure, Metrics, Money Laundering, PMO, Projects, Track. Bookmark the permalink. My sympathies are with the smugglers and pirates. quick for newbies. May you please extend them a bit from subsequent time? Good starter educational piece, and I think the length was just right, as a interest-builder.